HTC's New York press event, where the company announced the new HTC Windows Phone 8X and Windows 8S handsets, wrapped only a short time ago, but competitors are already flinging jabs and jibes its way. In a statement to The Verge, Chris Weber, Nokia's head of marketing, called the new devices, which HTC and Microsoft are touting as signature WP8 handsets, "good news for the Windows Phone ecosystem." However, Weber took issue with the devices themselves, indirectly accusing HTC of "tactically" re-branding its devices instead of creating something entirely unique with the new OS. "Nokia is driving an industry-leading smartphone franchise - that we call Lumia - exclusively around Windows Phone," Weber said in the statement. "With Lumia, we are creating truly differentiated experiences like PureView imaging, location and navigation, wireless charging and Nokia Music. And we're just getting started!" 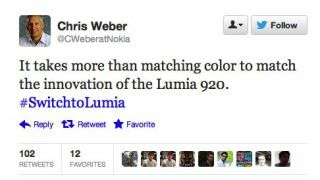 Weber later took to Twitter, sending out an inciting message: "It takes more than matching color to match the innovation of the Lumia 920 #SwithtoLumia." While the phones are still fresh and none have hit consumers hands, Microsoft is clearly taking sides already. The company rebuffed Nokia and its Lumia 920 and 820 handsets as standard-bearers of its Windows Phone 8 OS. Steve Ballmer, Microsoft's CEO, appeared along side HTC's head honchos to announce the devices, calling them beautiful and a way for Microsoft to "tell our story clearly and crisply." He said the 8X and 8S venture marks "the next chapter of HTC and Microsoft." Although Nokia has been somewhat relegated to a black sheep position, time will tell soon enough who reigns supreme in the new Windows Phone 8 regime.